Sarah Kreps, associate professor of government at Cornell University, argues that part of the reason is the lack of a war tax—a special levy historically paid by the American people during times of war. Her new book, "Taxing Wars: The American Way of War Finance and the Decline of Democracy," makes the case that war taxes held leaders accountable, because the public was regularly reminded of war's cost. "For most of its history, the United States had paid for its wars through war taxes, and then around the Korean and especially the Vietnam wars, the United States started avoiding these taxes and paying for war through debt," Kreps said. "The effect was to create a distance between the public and the war, and erode these accountability linkages and remove these constraints on the ways the United States fights these wars." The all-volunteer military, the use of drones and the geographical distance all make it easier for most Americans to forget about the wars overseas. But that isn't the whole story, Kreps said. "A lot of people have studied the all-volunteer military and its effect on the ways wars are fought, but no one had studied the effect of the way wars are financed and how individuals come into contact with these costs," she said. "This should be part of the national conversation." During the Korean War, President Harry S. Truman levied war taxes twice in 1950 and a third time in 1951. When he ran for reelection, he was derided as "High Tax Harry" and defeated. President Lyndon B. Johnson learned from Truman's defeat and introduced a war tax just once during the Vietnam War—partly because it would have been politically unpopular, and partly because he feared it would draw scrutiny to other social programs he championed, Kreps said. Johnson's 1968 war tax was the last time such a tax was used in the United States. 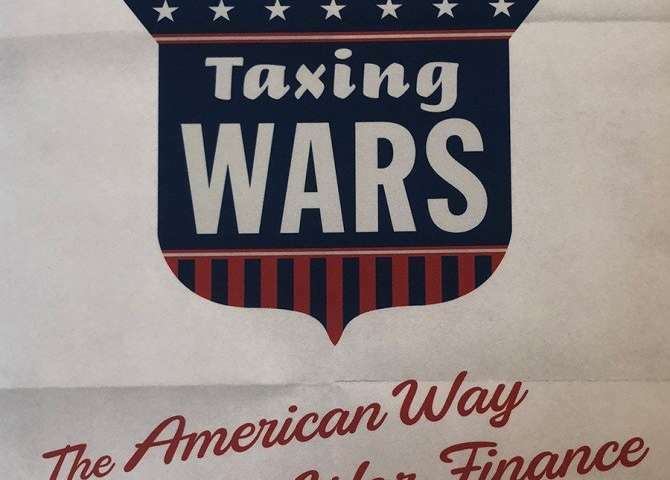 Although reintroducing war taxes seems politically infeasible in the current climate, Kreps said even a small, symbolic tax would likely help raise awareness and public pressure to end wars. "Something like a five-cent gas tax would at least make people think about it and ask questions about where these resources are going and whether it's still the right strategy," Kreps said. "But there's no public discussion about it, and that's exactly what's been missing and has led us down this path." All government spending from wars to health care funded on debt has a similiar effect, because the average voter sees only part of the tax and believes the burden of government on their person is lower than it actually is. Meanwhile the debt shows up as inflation and income disparity as the money is spent selectively by the government. This allows the government to run ineffective, inefficient policies, just throwing money around and paying their close buddies while the blame is put elsewhere. In the US this started all the way back in the New Deal when the government printed more dollars to bail out the banks and spent money they didn't actually have to "save" the economy. It provided some temporary relief, but then WW2 came along and everybody got jobs in the war machine and exports/industry soared, which really rescued the economy. This of course appeared as if the New Deal was a success, but in reality it started the soaring national debt that never stopped. It was never declared an actual war. Wars require lots of legal paperwork and restrictions from things like torturing prisoners. Operation Enduring Freedom, on the other hand, has all the earmarks of war without all the legal messy stuff mixed in. It is legal fiction yet has earned the military industrial complex literally hundreds of billions over what they would have if it didn't happen. Yes, wars should be taxed, so should "wars". Of course a liberal would automatically think of another tax. "why have the U.S.-led wars in Iraq and Afghanistan lasted for more than 15 yrs?" -Those wars were designed to bleed off excess males of fighting age to pacify critically dangerous and overcrowded regions. Bin laden and the Taliban convinced hapless, disaffected men and boys in nuclear Pakistan and elsewhere, to take up arms, head west and into the guns of coalition forces. This is the reason the govts in these regions remained stable during the Arab spring. Like the Vietnam war and so many others, they were never meant to win anything. They are an integral part of a process of sociopolitical engineering... of obliterating obsolete cultures and replacing them with something more compatible, which can take generations. Vietnam today is a productive member of the world community. Its population growth is at last sustainable, due in part to the emancipation of women and a near 20% ABORTION rate. -What a load of infantile rubbish. 'The world is a shitshow run by morons and idiots', yet it is better, more peaceful, and more prosperous than it has ever been. I suppose some people were saying that before the great depression. I suppose they were saying it before ww2. I suppose they were saying it before the cold war and 9/11 and the Arab spring etcetc. But after each, the world emerged better, more cohesive, more capable, more prepared. We are on the verge of leaving this planet, a species-critical event, BECAUSE of everything that has happened in the last several centuries. We would not, could not have developed this capability had not all these calamities and failures taken place. No rockets, no nukes, no electronics, no medicine, no life science, no sustainable growth, no complex high tech industrial base, etcetcetc. We'd still be gazing up at all those mountain-sized rocks whizzing by and praying to some god to protect us, because that's literally all we would have. But now we have the ability to save the species from extinction, and from itself. This situation we find ourselves in cannot possibly be the happenstance product of 'a shitshow run by idiots and morons'. Why is it that "democratic nations are supposed to fight shorter, smarter wars"? Because the people are constantly reminded that the war is ongoing and they'll oppose a longer war? Notice the United States. Those in power keep intoning that "terrorism" exists and can never be stopped because it comes from "stateless" agencies and the public buy it! Why? Because many if not most of the public at least act like, if not are, witless, drug addicted dullards only interested in watching "reality TV". They don't want to think things that require depth. They don't want to consider, for example, that the New World Order lies about "incidents" or manufactures them to keep military operations going across the globe. A "democracy" requires the vast majority to be intelligent, not driven by craven motives and to have actual mandate placed with the people. America is run by the rich telling the morons what to think. How do you explain that eikka? I don't. The world muddles along as it may. Is it any better today than it was a million years ago? How do you judge? By the amout of material goods you have? When the whole world is heading for a Malthusian catastrophe due to overpopulation and overconsumption, ruining the very atmosphere that is supporting human life? Besides, you're begging the question anyhow. -Those wars were designed to bleed off excess males of fighting age to pacify critically dangerous and overcrowded regions. Those wars never consumed enough people to make the difference you're insisting. Most people in a war come back alive, because it takes about 12 men to for one front-line combatant along the logistics chain. "A 2008 study by the BMJ (formerly British Medical Journal) came up with a higher toll of 3,812,000 dead in Vietnam between 1955–2002"
-in addition to civilians never born due to lack of food, clean water, displacement, fractured families, etc. "War has directly resulted in the deaths of 149,000 people in Afghanistan and Pakistan between 2001 and 2014"
-again, in addition to those never born because husbands were off fighting and dying, while their wives and children were starving back home or on the road. Vietnam was a concerted effort over many gens by the french, US, and communist forces to destroy that obsolete culture. Afghanistan has seen similar tag team efforts over a century or 2. I don't. The world muddles along as it may. Is it any better today than it was a million years ago? A million years ago the human race was still subject to many of the attritive elements that served to keep its numbers in check. But with each advance in technology or social order, pop spikes would inevitably be followed by collapse, war, etc with increasing severity and frequency. A mystery needs to be solved. And the mystery is, why are we still here when the whole planet should look like the iraqi desert? We won the war in vietnam. As I say it is peaceful and productive today. Same goes for china and south korea. Afghanistan is still a work in progress, as is north korea, although the communists have made great progress in destroying the recalcitrant culture that still exists there. Quick way to do that is to make ALL Businesses that do contracting for the US Govt require that their papers of Incorporation stipulate that there can be NO Dividends paid on stock, that any bonuses be applied exactly equally in dollar amount (not just 'equitable amount') to everybody below the individual so awarded, since Corporations are always teamwork, and if the leader of a section gets a bonus for production or whatever, then Everybody in that division should get the same exact amount. Not just the pipsqueak at the top without which the group would run just fine anyways. That and tax the Corporations that the 'war' is for. In Iraq we need to tax the Oil Producers really heavy, them and Halliburton who raked Billions on their No-Bid Deals. Lot of ways to deal with it at the production end, not just the 'bang end' of the gun. Also, The Powers That Be have always known that it is the young, intelligent, active and healthy young men that tend to cause revolutions at home when conditions get intolerable, similar to have they have been getting here in the last decade. They ran a draft and got rid of a lot of middle class family kids, went to volunteer and now have a lot of either poor folks who cannot find good schools or training in the civilian world, or the middle class using it as training and a chance to see the world. The Rich manage to get slots in Military Officers Schools and so we see a lot of the Officer Class being the clueless rich folks, and they are popped right into their 'proper' social standing, so the rich use the Military as a ladder. if the leader of a section gets a bonus for production or whatever, then Everybody in that division should get the same exact amount. Not just the pipsqueak at the top without which the group would run just fine anyways. I'll go out on a limb here and assume you're a communist? How are all the commies of the world doing by the way? -which is why you commies tend to kill them all or send them off to gulag. An entire middle class in the USSR. Pol pot killed all who wore eyeglasses. BTW, eikka, I'm sure you're aware that humans have faced extinction at least twice in the last million years. Perhaps 1000 breeders or less. Not so much now that we are poised to spread our seed around the inner system eh? oh, otto, you altright fairytails are just jealous that right-fascism is not as competent at mass murder as the left-fascists. As for the article, it clarifies a few historical points. Then tiptoes away to avoid hurting anybody's feelings. This is the Age of the Prophet Orwell. The Age of Perpetual Wars. Good for business, good for internal suppression of freedoms. Good for manipulating media and religion to encourage Hate and Fear. Good for the "triumph" of the lowest common denominator. Though otto,, upon further reflection. Maybe you are right about encouraging space travel. Send all the wanna-be-a-conquistador off to fight on the worthless planets Luna or Mars. Remember Clark regretted not patenting his idea of satellites in Geo-synchronous orbit. I can see it now.... Solar System Broadcasting presents! otto's latest installment of Luna vs Mars. Let the best space warriors win!" With Holst "Bringer of War" playing in the background. "The high incidence of [psycho]pathy in human society has a profound effect on the rest of us who must live on this planet, too, even those of us who have not been clinically traumatized. The individuals who constitute this 4 percent drain our relationships, our bank accounts, our accomplishments, our self-esteem, our very peace on earth. "Those who have no conscience at all are a group unto themselves, whether they be homicidal tyrants or merely ruthless social snipers. "The presence or absence of conscience is a deep human division, arguably more significant than intelligence, race, or even gender." -ie a new kind of animal. "So why have the U.S.-led wars in Iraq and Afghanistan lasted for more than 15 years?" Because nowadays we don't have the balls to totally smash our enemies and rebuild their government and culture like we did with Germany and Japan after WWII. These days we beat them up a bit and fall back and let them rest and rearm. If you don't get rid of the roots, the same weeds will keep coming back. I dont think you understand. Smashing them would mean killing pretty much every one of them which is actually what we, the Russians, and others before them have been doing all these years, but these things take time. Afghans and Pakistanis are not obediently lining themselves up out in the middle of the desert where they can be carpet bombed and bulldozed like the Iraqi army now are they? Although doing that obviously took the kind of balls you're claiming 'we' dont have yes? "The war began in December 1979, and lasted until February 1989. About 15,000 Soviet soldiers were killed, and about 35,000 were wounded. About two million Afghan civilians were killed." -THAT is victory by pretty much any measure yes? You sit, make yourself a target, draw the enemy out, and annihilate them. Over and over. Over gens they get tired of it, the culture evaporates, just like indochina. These things take time. The culture is the enemy, not the people or their govts. So why have the U.S.-led wars in Iraq and Afghanistan lasted for more than 15 years? If people aren't asking what their taxes are being spent on then having a (even symbolic) war tax isn't going to change that. Short answer; Read '1984' and you will understand EXACTLY why these wars continue unabated. The book describes the situation as if the writer were right here, right now. In order to implement the New World Order it is necessary to have world chaos and offer the people safety in exchange for their freedoms and autonomy. That is the reason behind the ME crisis/wars and the mass world migrations to western nations. The US progressives and deep state are major players in this plan and daily indoctrinates its citizens as to the benefits of open borders. Well. mr666, having your worthless cracker trailer-trash cluttering up the scenery is a gross offense to American Society. Time to ship off you and yours back to the old country. You can take up your family tradition of village idiot and family profession of honey-bucket collector. Yup the deep state is very upset with Trump. How dare he try to improve relations with Russia. Trump is upsetting their timetable for the start of WW3 and the rise of the NWO from the ashes. Here is a little tip. Any time the Republicans, Democrats and the press all unanimously agree on something you, the public, are about to be seriously sodomized. From a budget perspective, it is pretty logical that Congress should raise taxes to pay the financial costs of waging the new war. If we don't want to pay the taxes to finance a war, then we probably shouldn't have that war. And from a social fairness perspective, it is fair that the burdens of war should fall more broadly on society, not just on the soldiers who give their blood and lives. Those of us who stay home should at least be willing to pay taxes to support the war, or we shouldn't be having that war.